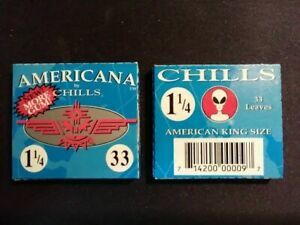 CHILLS ALIEN King Size Select Hemp Rolling Papers. TWO PACKS. 33 leaves a pack. Details about Chills Americana 1 1/4 Hemp Rolling Papers TWO PACKS. 33 leaves a pack. Chills Americana 1 1/4 Hemp Rolling Papers TWO PACKS. 33 leaves a pack.